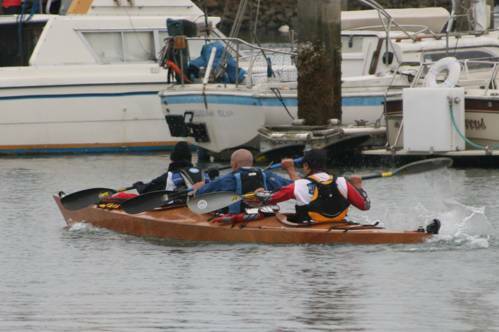 After a very quiet winter and a slow start to the season, this was to be the first race of 2009 for Team AR Navigation Supplies. Andy had spent the spring climbing in Nepal and putting some serious miles on his INOV-8 shoes, Mari had recently won the Duathlon National Championship, crushing the course record by ten minutes and I had been “training” while doing a bit of road racing and mountain biking. I was a little nervous that I was going to get my legs pulled off by my two teammates and be dragged face down back to the TA without them even breaking a sweat. If you knew these guys you'd understand my concern. We decided to get to the start early and give us all time to get everything set up and ready. We arrived so early that only Hani Juha from the California Adventure Racing Association was there before us. The place was deserted and we had the pick of the TA spots. Mari showed up about 15 minutes later having timed it just right to avoid having to get the kayak off the truck. The mood seemed very relaxed while I caught up with old friends for the first time this year. Before the start I was chatting to Michael Miller who told me that he was racing on a borrowed bike as his own bike had been stolen out of his garage the day before the race. He'd had to call around and get a loaner to use. Hopefully the replacement was just as nice. Todd Jackson gave out the maps and gave us about 10 minutes before he called a pre race briefing. 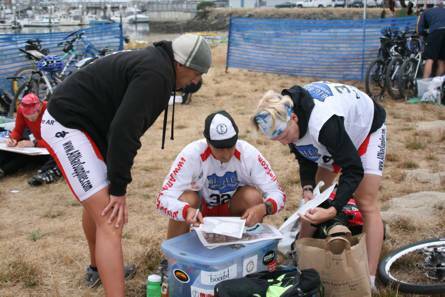 We would have to plot a number of UTM's, one of which was only given to us about 2 minutes before the official start. This had teams scrambling around trying to get everything done, but like us, most were still sitting in the TA when the gun went off. I heard stories that some people didn't leave for another 30 minutes although we were out of there within 2-3 minutes of the start thanks to the Basic Roamer AR and its quick plotting capabilities. While I was plotting and checking the CP's with Mari, Andy had managed to pick up our triple kayak by himself and carry it down to the water. The tide was the lowest I'd seen it for the Ocean Blue event which means Andy must have carried the boat about 20-30 yards!! As Mari and I ran down to the boat Andy was standing with our PFD's ready and I basically ran into mine and just had to zip it up. We pulled out into the harbor and could see a couple of teams to our right heading under the piers. The route under the piers is a shortcut for the smaller boats but for the big triple its way too tight. 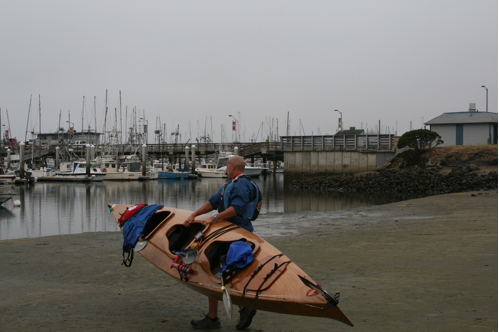 As usual we would go around the piers and still catch the other boats before we reached the mandatory portage over the beach and into Mavericks. 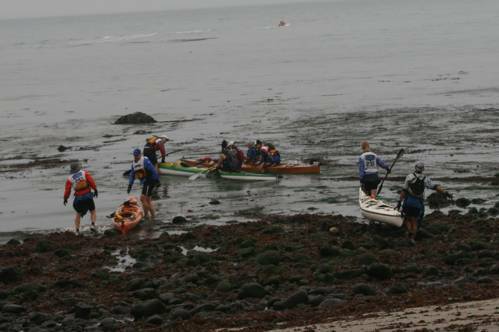 As we were carrying the boat over the seaweed covered slippery rocks we noticed that Karl Royer from Team Cyclepath had pulled along side us. They were using a seriously fast 2 person boat and jumped ahead of us leaving the beach. As we headed out to the first buoy we could see a bunch of surfers to our right. This was the first time I'd seen anyone surfing Mavericks while we were racing, and it made me a little nervous that this wouldn't be as smooth a ride as previous years. We were heading towards the beach where the 3rd CP was supposed to be when we spotted CP 4 way off to our left. If that one was there then it must be CP 3 that was missing so we changed course and headed straight for it. On this section Cyclepath seemed faster as the water was a lot calmer and they could really paddle. They overtook us going into the harbor entrance and were going to be first back to the beach when they took a wrong turn and missed the second entrance to the inner harbor. I was wondering if they were taking a secret short cut but it turned out they just missed it. We arrived back to the beach and jumped out of the boat. As I picked up the boat I slipped on a wet rock and my knee hit the rudder. It hurt but I didn't think much of it until I arrived into the TA with blood pouring down my leg. No time to worry about a mere flesh wound, we quickly changed into our bike gear, I put the map on the Rotating Map Holder and were off on the ride down Hwy 1. Andy had a little trouble with his chain coming out of the TA but soon fixed it and we were off again. This year we were allowed to use Hwy 1 all the way South and didn't have to worry about the back roads and bike path as in other years. This was great as we just put our heads down and went for it. We were the first to arrive at TA 1 and made a quick transition to the run section. This is where I was expecting to suffer badly at the hands of my teammates. We decided that we were going to get all the CP's that were available which meant we had to move fast. As it turned out I wasn't feeling too bad and managed to stay with them on the run up the first climb. We found the first CP exactly where it was supposed to be. I had re-calibrated the Waterproof Pedometer and it was counting the distance off precisely. We took the singlet rack trail to CP 2 and found it easily. At this point we decided to have a little fun and took the race off trail. Rather than take the trail all the way around we made the decision to cut up the side of the mountain. I took a bearing and pointed the direction to Mari and Andy. This turned out to be a big mistake. I'd broken one of my golden rules of never bushwhacking uphill. We were doing great for the first few hundred yards, it was steep but fairly open. It was near the top that we hit some seriously think bushes. It took us nearly 5 minutes to scramble the last 20 yards and this stuff was nearly impassable. Eventually we made it out and stepped onto the trail in precisely the right spot. Right at the intersection of North Ridge Trail and the small trail leading to the PC02 gate. This was perfect. A very startled jogger was standing there as the 3 of us stepped out of the bushes, all dressed the same, me covered in blood from the knees down due to the kayak incident and the thick brush, followed by Mari, also bleeding from the knees down and Andy, who seemed to be unmarked as his long legs just stepped over the worst of it. The jogger proceeded to give us very precise direction to the nearest parking lot, which is exactly where we need to go for CP 4. We thanked him and started running. He must have thought we were crazy or really lost to have been coming out of the bushes from a direction where there was obviously no trail. When we arrived at CP 4 we had to answer the question of what activity number 12 was. The problem was that the board had 4 activities labeled as number 12. We wrote them all down hoping one of them had to be the correct answer. Next we needed to do the out and back to CP 1. I'd been fine running with Mari and Andy on the up hills but it was the downhill sections where I was getting left behind and this route had some serious down hills. Just as we reached CP 1 we saw Michael Miller coming down the hill towards us with his teammate. This was the first team we'd seen in nearly 3 hours. We made our way back downhill to the TA and our bikes. As we arrived Hani and Julie of RWG were just leaving along with Lou and Joe of the Venomous Ducks who were still talking smack at their first race this year. We gave as good as we got in the verbal jousting as they rode off. They asked how many CP's we'd got and were shocked when we said all of them. They had missed at least one each so we were still leading even with our off trail excursion. We caught both teams on the road section and had a small lead by the time we reached the farm. We saw some other teams coming along the road towards us. They had obviously gone to the farm first and were now on their way to the run section. We went for CP 6 first and found it sooner than expected. We were a little concerned that it was one of the Spring Course CP's and not ours but a quick check of the surrounding terrain confirmed we were in the right spot. We even re-plotted the CP on the map just to be sure. The next 4 CP's were very straightforward but CP 5 slowed us down a bit. I thought I knew where it was but the team were concerned about the barbed wire fence and thought we might be going onto private land if we went where I suggested. Another couple of teams had the same issue and we were all looking around when I persuaded Mari to follow me over the fence and up the side of the hill. We found the CP and were on our way back down before the other teams had even had a chance to follow us. find the winter hours of the gas station. This was less than half a mile run so we set off as fast as we could. We arrived back in a few minutes and handed our passport in. We were the first to finish and had found all the CP's in a time of 6:41:20. After our passport had been checked all we had to do was relax and watch the rest of the race unfold. 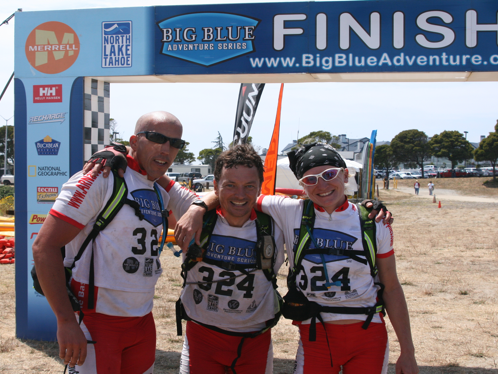 This was another great edition of the Ocean Blue Adventure Race put on by Todd Jackson. The post race food was fantastic as well as having the chance to hear all the stories from the other racers.